Make Hancock Physician Network payments online or find out about financial assistance. 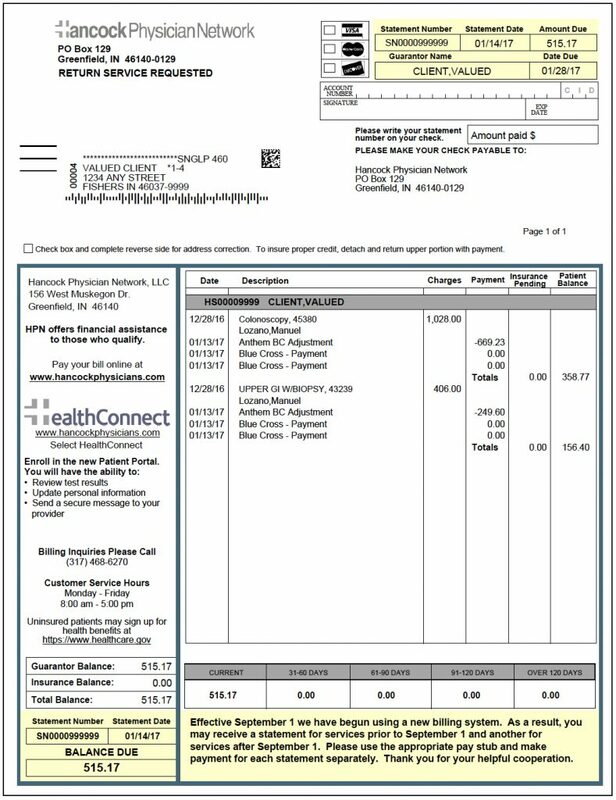 If you’ve received a bill from the Hancock Physician Network (see example below), we offer a convenient online payment option. If your bill doesn’t match the above, please visit the Hancock Regional Hospital billing page. If your bill does not appear to match the examples shown on either page, send an email or call the Patient Financial Services Office at (317) 468-4900. You can also pay your bill by mail, in person, or by phone. Call (317) 468-6270 to pay with your credit card over the phone. Please have your card information ready. If you have healthcare needs but are unable to pay, please know that we are committed to offering financial assistance options, and will be happy to work with you. Learn more about what we can do. You can also learn more about billing and insurance by visiting the FAQ page. For full plan details, download a PDF.